I’ve been using git for years now but had to start using SVN for some projects. I found that GIT is good enough Subversion client too, especially as I retain the ability to commit often and rebase my work on top of commits from other devs (on the SVN side). The only question arose – can I merge two SVN branches so that GIT log will show the merge? The git-svn manual states that one should avoid all git clone|merge|pull|push activity when using git-svn. But git log does show merge history that was created in Subversion – how does it do that? Subversion does not support actual merge of branches (more like cherry-picking), but since version 1.5 Subversion supports the svn:mergeinfo property that is used to track what has been merged into this folder previously. 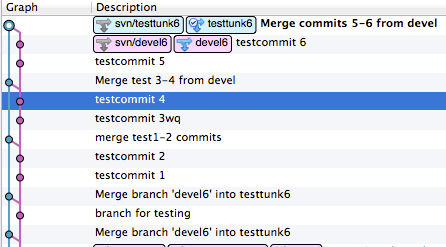 git svn dcommit --mergeinfo "/branches/somebranch:1-3"
NB! the svn:mergeinfo is overwritten with whatever is given on the command-line, so be careful to list previous merges too. I had some troubles with the automatic mergeinfo – for one reason or the other GIT calculated it wrong and I couldn’t get it to work. To automate the process, I wrote a shell script git merge-svn which can be used to merge two SVN branches with correct svn:mergeinfo set on the dcommit. the branches have been already merged in git (but not in SVN) – will traverse until previous ancestor for the merged commit revisions. Nice work, and I have used it for 2 months without a problem until today. Unfortunately, I got a problem that after merge, the remote url changed to the FROM branch because git merge using the fast forward, so maybe you could add –no-ff to git merge command. Gist doesn’t have a pull request feature, so I can only leave the message here. and my fork is : https://gist.github.com/theantway/11278250. Anyway, it’s a great work, and saved lots of my time. Thanks. Thanks! I merged your change (Gist is actually full-blown git repo, so even w/o pull-requests, merging is possible).